Tammy Stellanova's desire to be an artist is rooted both in her longtime fascination with the living form (she has a degree in biology from the University of California at Santa Cruz) and her passionate love for comic books and other graphical narratives. A longtime amateur comic artist, she made the decision to pursue a formal education in art in 2000 and entered into the highly-regarded illustration program at the California College of Arts and Crafts (now known as California College of the Arts). She received her Bachelor of Arts degree in Illustration from CCA in 2003, and now works as a freelance illustrator and runs her own illustrated jewelry business. 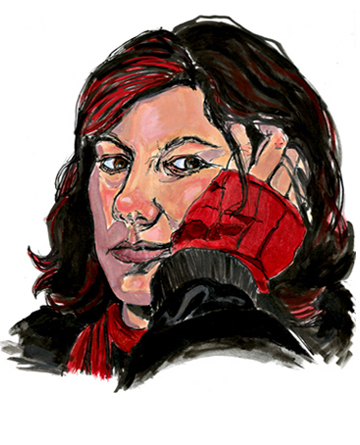 Tammy also self-publishes her comics and illustrated travel journals. Tammy Stellanova is the creator of Stellanova Jewelry, a collection of illustrated curios inspired by the aesthetics of Victorian naturalist artwork. Please visit the Stellanova Jewelry website to view and purchase pendants, rings, earrings, and wine charms containing Tammy's original natural history illustrations. Tammy splits her time between the big island of Hawai'i and the San Francisco bay area, two of the most beautiful places in the world to live.